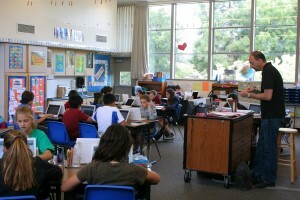 Richard Julian's bright, well-equipped fifth-grade classroom in Los Altos. As an education reporter, I have seen the entire gamut of schools -- but never in a single day. The way my schedule came together yesterday, I ended up visiting three different campuses, each representing a vastly different picture of the American public school system. Combined, the visits have all the makings of a Dickens novel: one is a gleaming campus experimenting with cutting-edge ideas, another is an island of relative safety surrounded by a deteriorated neighborhood, and the other is a scrappy, middle-class beacon, pushed to excel by a highly involved parent community. The day started with a visit to Covington Elementary School in Los Altos, an affluent suburb in the heart of Silicon Valley surrounded by scenic hills. The school’s exterior is every parent’s dream: beautifully landscaped garden beds, wide, open-air hallways, new playground equipment, and huge windows in the classrooms looking out onto tree-covered hills. Will providing computers for impoverished students help them get to college, or give them a chance at a better life? 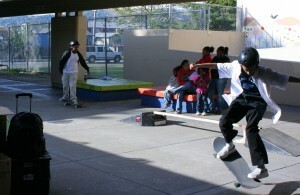 During skateboarding demonstrations at Elmhurst Community Prep, students show off what they've learned during their after-school program. Later in the day, I visited Elmhurst Community Prep, a middle school in one of Oakland’s rougher neighborhoods. Just outside the perimeter of the campus, homes have barred windows and huge piles of trash are strewn on lawns covered with empty, overturned shopping carts. Inside the chain-linked fence, students are excited about an end-of-school event celebrating their accomplishments from an immersive after-school program. (I was there to interview one of the kids and will write much more about that, too.) The principal of the school, Laura Robell, greeted all the students warmly, and welcomed back visitors who’d graduated. I spoke with her for just a short time, but it was clear that this was going to be an emotional night for her, seeing students, who are living difficult lives by anyone’s standards, demonstrate the projects they’ve completed during the past few months. The day ended with my own daughter’s spring musical concert at Crocker Highlands Elementary, nine miles but a world away from Elmhurst. Playing the piano and leading the group was our elementary school’s PTA-funded music teacher, Miss Rose, a talented and vivacious educator who sneaks in current events and history lessons into the 45 minutes she gets every week with her kids in the tiny, windowless room set aside for music class. (For the record, neither she nor any of the students complain about the room.) Last night’s performance included songs from all over the time spectrum – everything from “California Dreaming” to “New York, New York” to Taio Cruz’s “Dynamite.” Miss Rose’s very presence is a testament to the PTA’s commitment to bringing the arts to a typical, budget-crunched California public school. And although we don’t have a computer for every kid, we do have one for every 10 kids (more or less), another PTA accomplishment. So what does the future look like for these schools? Will providing computers for impoverished students at Elmhurst help them get to college, or give them a chance at a better life? Is an immersive after-school program necessary to keep students engaged in learning for the high-achieving population at the Los Altos elementary school? Can Miss Rose ever be replaced by software? New innovations and teaching techniques and ideas about learning will materialize (or be repackaged or reconfigured), and they will make an impact in their own way. But no single solution -- not bleeding-edge technology, not laser focus on science and math, not extending the school day, not newfangled assessments -- not any one of these things will be able to address the vastly different needs and populations of each school. And it's important to note that each one of these techniques will continue to morph and change. What we're witnessing now is just one moment in time. The one common thread I did see was that each school is pushing itself in its own way to serve kids the best they can with the resources and the information they have at this moment. And that gives me hope.